Gus Arnheim (September 4, 1897 in Philadelphia, Pennsylvania – January 19, 1955 in Los Angeles, California) was a pianist and an early popular band leader. 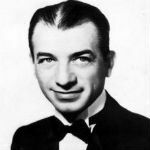 He is noted for writing several songs with his first hit being “I Cried for You” from 1923. He was most popular in the 1920s and 1930s. He also had a few small acting roles. In 1928-31, Arnheim had an extended engagement at the Cocoanut Grove in Los Angeles. In 1930, when Paul Whiteman finished filming The King of Jazz for Universal, The Rhythm Boys vocal trio, consisting of Bing Crosby, Harry Barris and Al Rinker decided to stay in California and they signed up with Arnheim’s band. While the Rhythm Boys only recorded one song with Arnheim, “Them There Eyes” (which also happened to be The Rhythm Boys final recording), Arnheim’s Orchestra backed Crosby on a number of songs released by Victor Records in 1931. These popular records, coupled with Arnheim’s radio broadcasts featuring Crosby’s solo vocals, were a key element to the beginning of Crosby’s popularity as a crooner. Arnheim grew up in Chicago and at one point was accompanist to vaudevillian Sophie Tucker. Arnheim’s orchestra made at least three film short subjects for Warner Brothers’ Vitaphone Corporation in 1928-29.